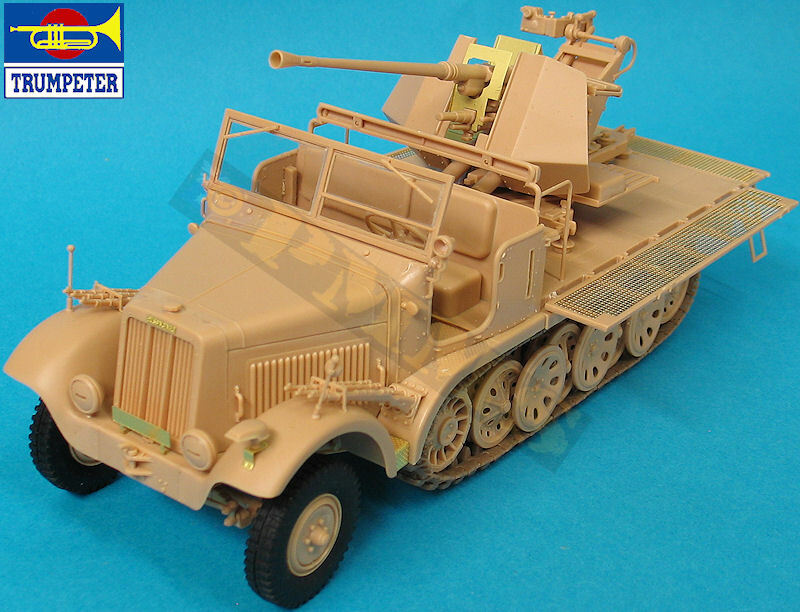 A lot more information has become available on the Sd.Kfz.6 series since I posted the review of the first Bronco Models Sd.Kfz.6 5ton Half Track ‘Diana’ (kit # CB-35038) but there are still areas of the vehicles not covered well in the available references. This refers mostly to interior detail such as the cab interior, the inside details of the chassis and the engine/engine compartment, much of the available interior reference is on the earlier chassis NB I 5 through 8 but little on the BN 9 interiors which the two kits are based on. This lack of information has flowed through to both the Bronco and Trumpeter kits with the interior details differing considerably between the two kits while the exterior is fairly well covered thankfully but still there are some major differences in detail and dimensions between the kits, this can more easily be substantiated or not as the case may be. So with this in mind we’ll proceed gingerly in some areas to hopefully give some insight into the kits and at the risk of repeating myself I simply present the information and it’s up to the individual to take it or leave it as they see fit. I should also note that there is some marked dimensional differences in the 1:35 plans of the Sd.Kfz.6/2 found in the Panzer Tracts and Tank Power books listed below which again doesn’t help matters. 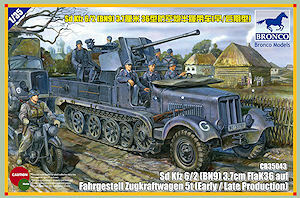 Those in the newer Panzer Tracts book match period photos more closely than with the Tank Power plans which are quite vague in parts probably as a consequence of the lack of data on the real vehicles as there are no surviving examples of the Sd.Kfz.6 BN 9 chassis to my knowledge. 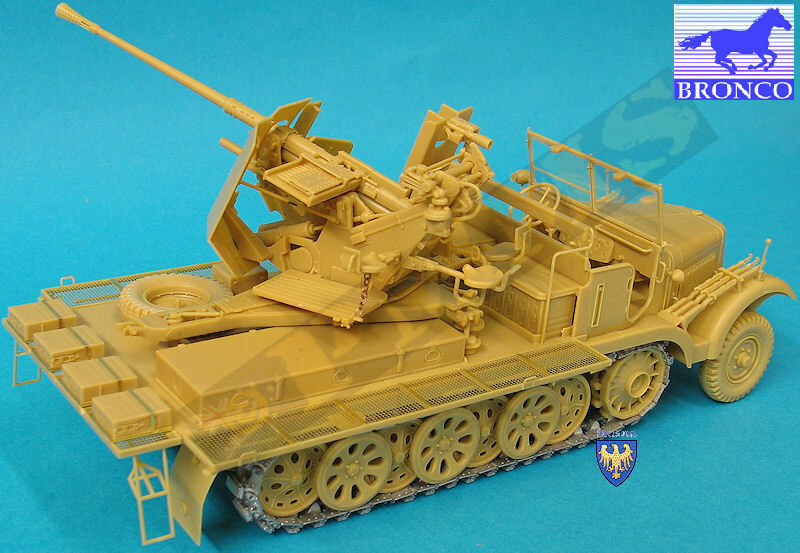 The kit has 676 parts in light beige plastic plus another 224 for the individual working track links, 7 in clear plastic, 88 etched brass parts, a short length of twine and fine chain plus the usual decal sheet and instructions. 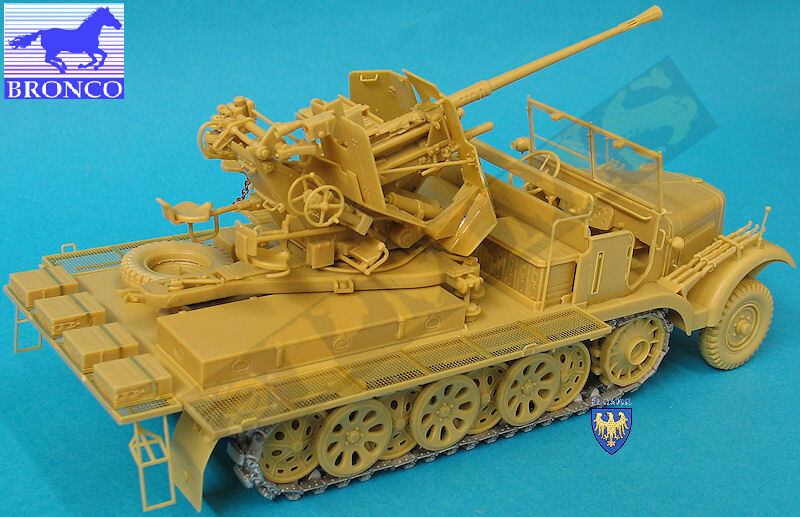 There are also 58 parts indicated as not being used as these are from the previous 'Diana' kit with the standard of moulding being excellent with just the odd bit of fine flash here and there and virtually no pin marks in places that will be seen after assembly. The moulding seams are very fine on most parts making for easy cleanup as well as the usual plastic nodes used to keep pin marks on the parts to a minimum with the etched parts cleanly done with engraved bending lines and embossing on some parts. 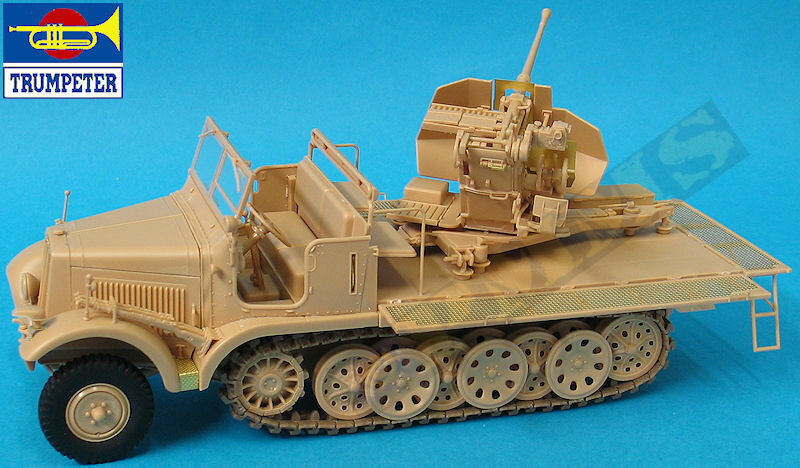 As you would expect the running gear/suspension is from the previous 'Diana' kit with new parts for the upper hull, rear flat bed and folding sides plus the 3.7cm FlaK 36 from the previous kit #CB-35042 combined for this new kit. 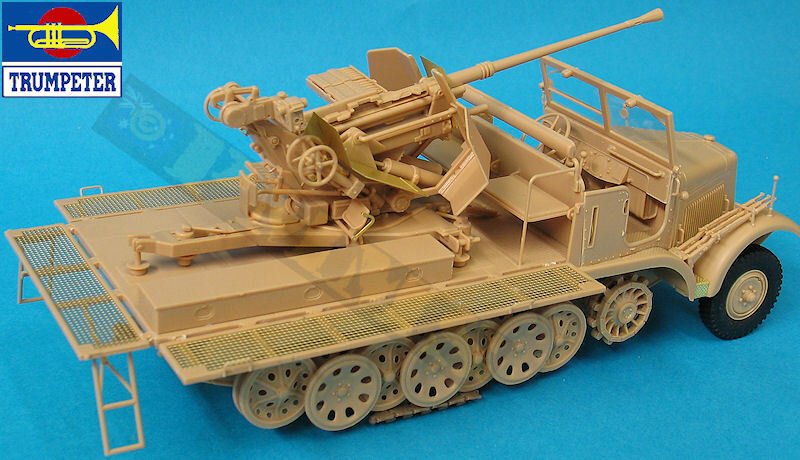 There are alternate parts for an early or late production 3.7cm FlaK 36 as well as alternate parts for similar early or late production BN 9 hull plus an extensive array of ammo boxes to load up the rear bed ammo bays. Also included is the full engine and driver's compartment with the individual link track plus two spare 3.7cm barrels in their storage box and an R36 range finder and storage box with the ability to build the kit in travel or firing modes. Dimensionally the kit measures out quite good overall against the 1:35 plans in the Panzer Tracts and Tankpower books listed below although there are a few notable discrepancies which will be looked at closer in the chapters below. 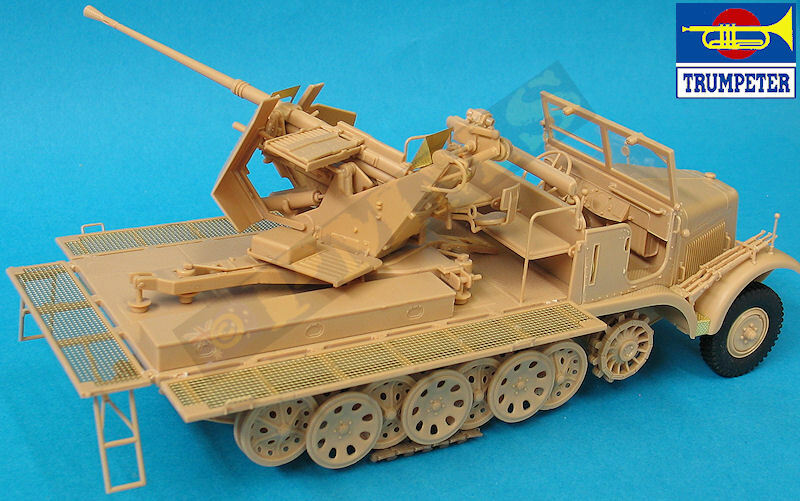 The kit has 411 parts in light beige plastic on 18 sprues, 9 parts in clear plastic, 240 individual track link parts in chocolate plastic on 10 sprues, 63 etched parts on 3 etched frets, 3 vinyl tyres, a length of thread plus a small decal sheet and 20 page instruction booklet. The standard of moulding is quite good without any noticeable flash and just the occasional pin mark although some of the detail is okay some is on the heavy side and a little basic most noticeable with the radiator housing and engine hood panels with the louvers moulded solid. Recent kits from both Bronco and Dragon have included open louvers of similar parts which sort of sets the standard for such parts. Dimensionally there are a number of issues with the kit, some fairly minor while others more substantial, the most notable issue is with the drive sprockets and tracks while in other areas it’s the detail you don’t get that is the issue especially with the 3.7cm FlaK as we’ll see in the chapters below. 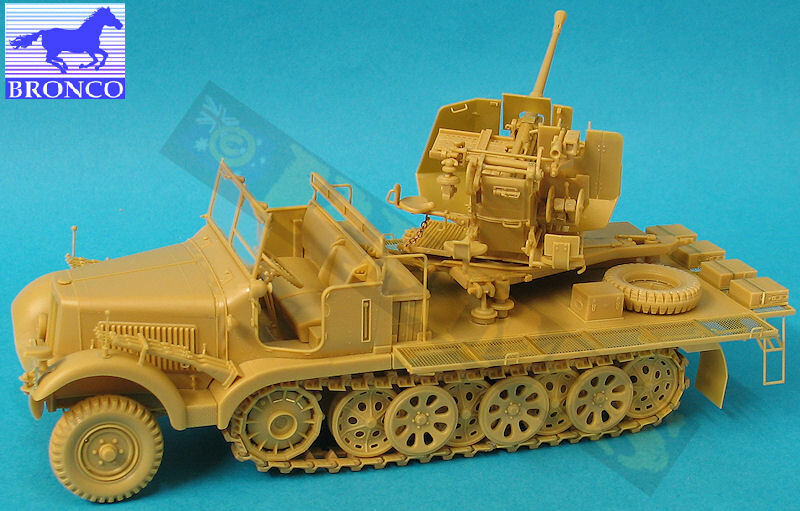 So where does this leave us in regards an accurate kit of the 5-ton Sd.Kfz.6 series as both kits have some major and minor dimensional and detail issues if this criteria is of concern to modellers. 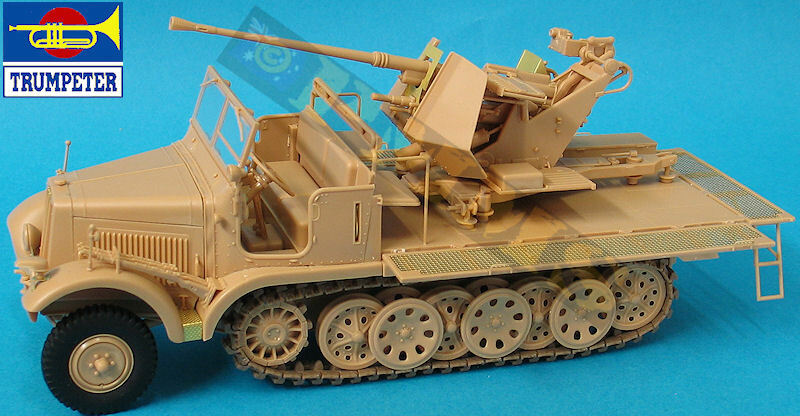 With the Bronco kit there are four main issues, the incorrect engine for the Sd.Kfz.6/2, the cab front/windsceen width and cab side panel profile (hard to fix) and the width of the front axles (easy to fix) and to a lesser extent the width of the tracks and road wheels spacing, other than that the details throughout are very well done with correctly sized drive sprockets and road wheel details, excellent detail on the front radiator grill and slide louver details (open mouldings) and the rear deck that captures all the features of the Sd.Kfz.6/2 deck very well. 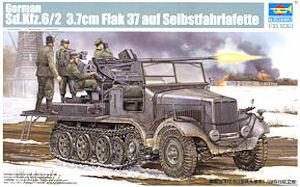 There is the correctly depicted spare wheel location, the underside storage lockers, the correct configuration of the side frames and the inclusion of the pioneer tools and ammo boxes so prominent on the real thing to the well done 3.7cm FlaK 36 with the correct gun sight, correctly sized gun shields and inclusion of the three crew seats (gunner’s and two loader’s) as well as the well done flash suppressor and the correctly raised gun base to clear the gear on the rear deck. The Trumpeter kit has a litany of issues starting with the short cuts of using the engine and gearbox from their previous 8ton Sd.Kfz.7 half-track kits, the drive sprocket being ridiculously too small with corresponding track issues, basic detail on the road wheels and front wheels as well as by today’s standards poorly represented front radiator grill and slide louver details (solid mouldings) to the rear deck that doesn’t represent that of the Sd.Kfz.6/2 much at all missing most important details such as the spare wheel storage location and the side mesh frame layout being again those of the 8ton Sd.Kfz.71/2 and not the 5ton Sd.Kfz.6/2. The Flak gun is also poorly detailed with undersized shields, the wrong gun sight and missing loader’s seats as well as undersized spare barrel box and no pioneer tools or ammo boxes which are so prominent on the real thing to the incorrectly depicted ammo trailer. 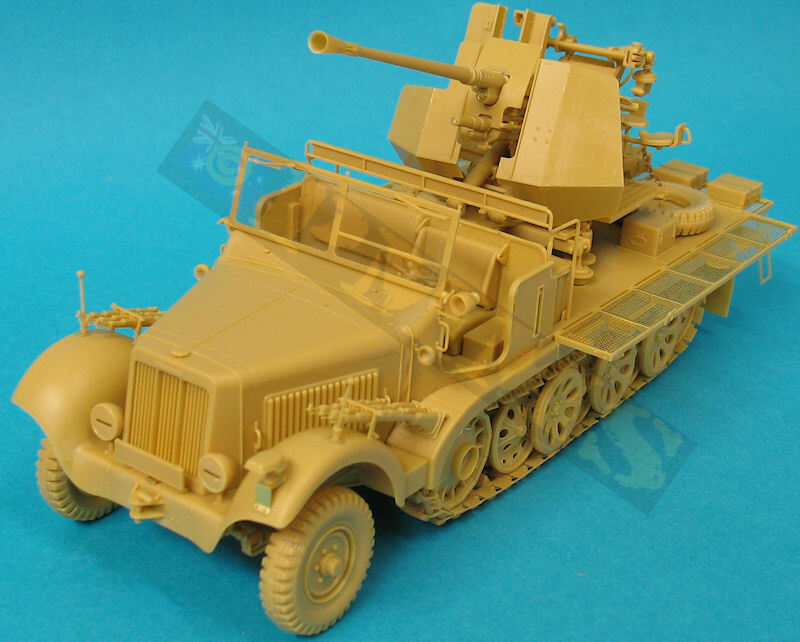 And so if accuracy and details is not high on your agenda the Trumpeter kit will build into a kit that looks like an Sd.Kfz.6/2 and does have an ammo trailer but if you do value accuracy and detail finesse then the kit rates poorly by today’s standards. The Bronco kit while not without its issues is fundamentally a better kit with better quality of mouldings and more accurate other than the issues mentioned above. But putting aside the issues raised and looking purely at what’s in the boxes the Bronco kit is clearly superior in all respects from quality of mouldings, details included and fit of the parts. 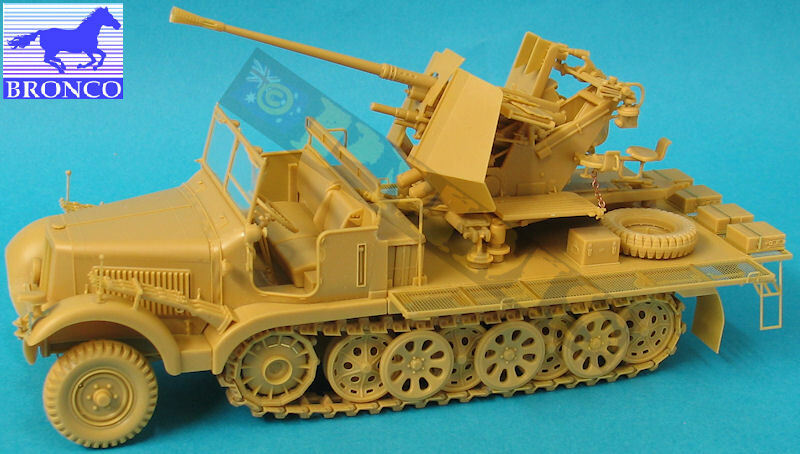 While personal opinions have no place in a product review as it should be on the product itself one can’t help but think the Trumpeter kit has been hurriedly cobbled together to counter the Bronco release with very little research as well as using parts from their existing 8ton half-track and 3.7cm FlaK 37 kits as shortcuts. So hopefully all that provides some help when deciding which kit if for you, not taking into account price and availability issues. Unfortunately some of these issues will be carried forward with the new Pioneers versions being released by both companies, but it does open up possibilities for the aftermarket producers. Published by Model Art Co.Ltd.